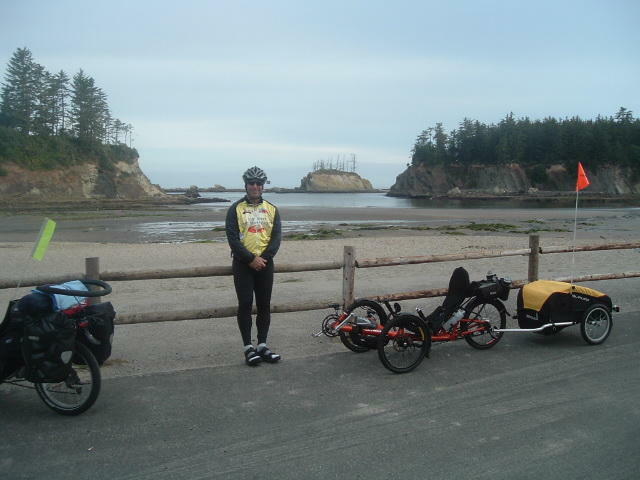 Here is yet another great trike trek taken by Bent-Up Cycles owner, Dana Lieberman. 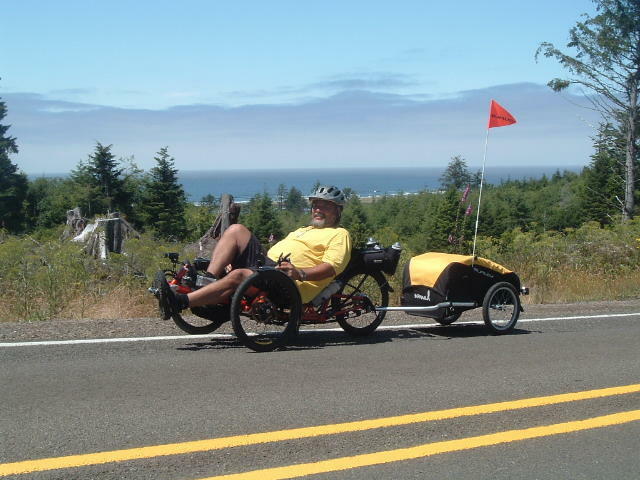 This time, Dana and his faithful friends rode their three wheeled recumbent tadpole trikes from Astoria, Oregon on the Columbia River, all the way south to the northern California border, a ride that many thousands of cyclists take every spring, summer, and fall. 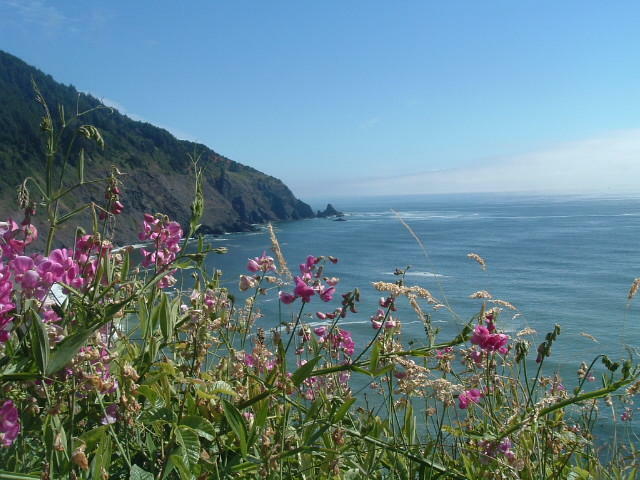 I couldn’t resist including this trek tale because the Oregon coast is my home playground, with my abode being about halfway from Washington to California. 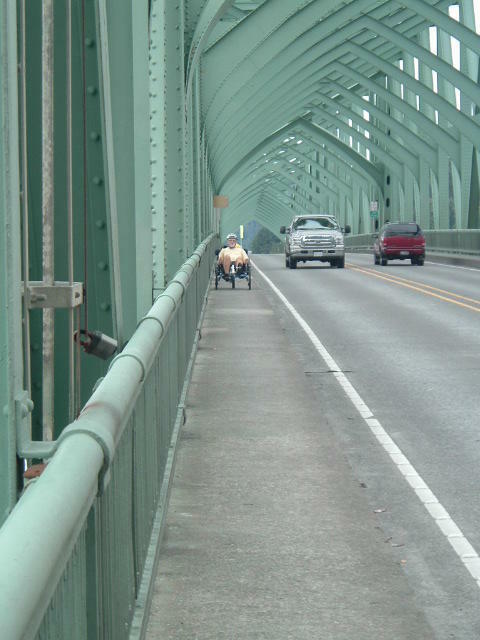 This story comes to us from Dana’s Crazy Guy on a Bike journal. 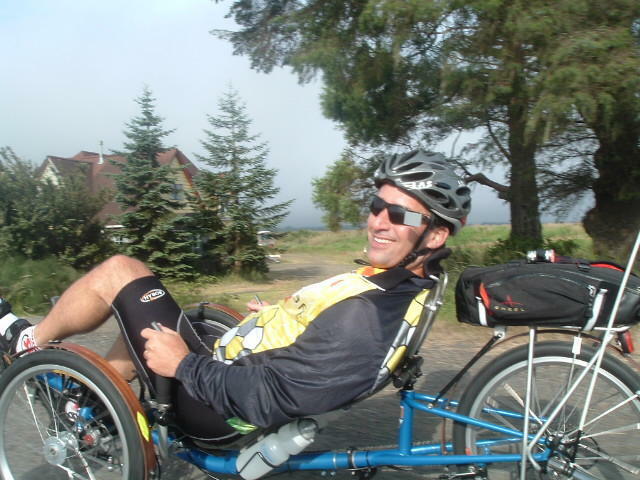 You may visit Dana’s trike dealership (he sells bikes too, but we’ll forgive him this time) by clicking HERE. Neal shows up to drop off his car at my house. 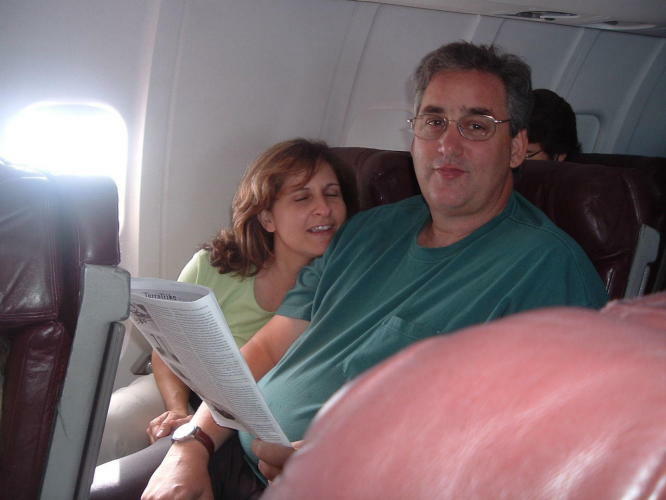 The plan was that he would drop off Peggy at the airport (5 minutes away), he would leave his car at my house, and we would take a taxi over to Burbank Airport with my bike. Well, the taxi was late to pick us up, and didn’t have enough room for the bike. So, into Neal’s van and off to the airport. 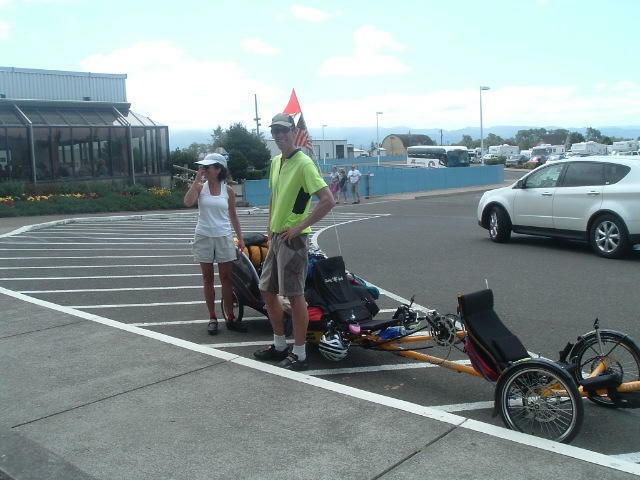 Peggy and I dragged three bike boxes around the airport while Neal parked the car. But at last, we were on the plane and on our way to Oregon. On the plane at last! We arrived in Portland to find out that Peggy’s luggage decided to visit Seattle. Oh well, we were here and I was not about to let a little glitch like luggage ruin the trip. After all, they promised it would be here soon, and the airline would deliver it all the way to Astoria if they had to! Lonnie, a member of the OHPVA, volunteered to pick us up from the airport and drive us to Astoria. He was an amazing host/tour guide. 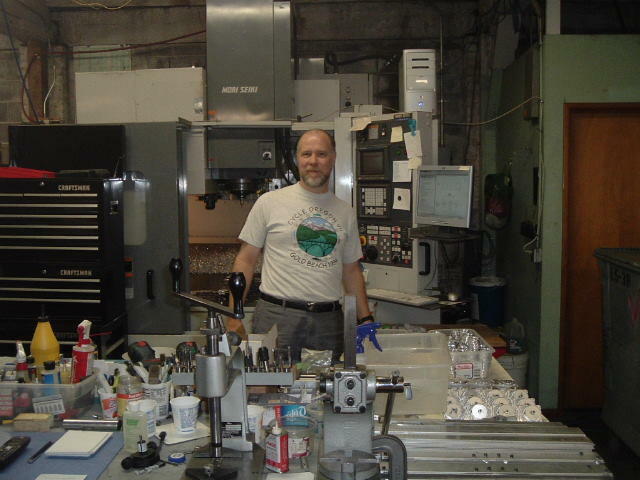 First, we went to the infamous Terracycles factory to meet Pat Franz, take a tour and then go out to lunch. Pat Franz in his home-away-from home. 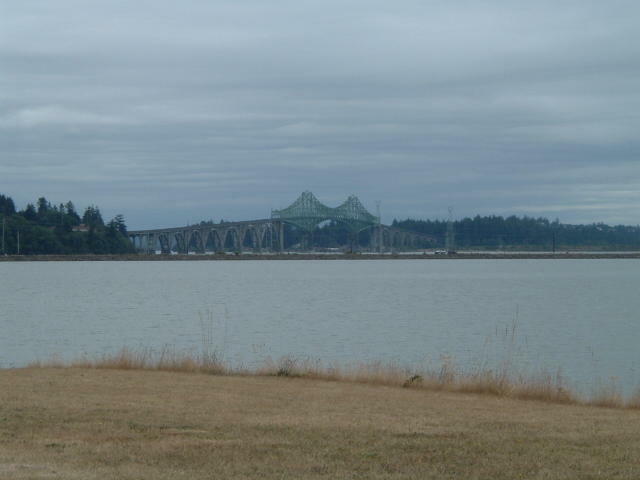 After lunch, we enjoyed a beautiful drive out to Astoria. Northern Oregon was in the middle of a heatwave, but the 90-100 degree temperatures didn’t seem so bad to us So Cal residents. 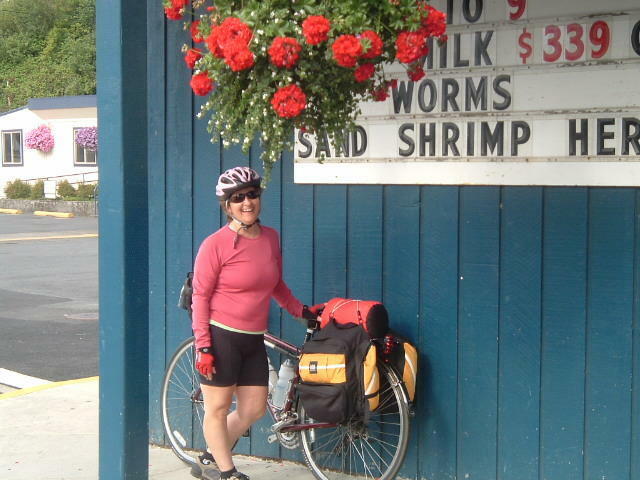 We arrived in Astoria, met up with the rest of the riders (most of us were staying at the Red Lion Inn), and went out for a fanatastic dinner at the Silver Salmon. For me, the highlight was having my mother drive down to have dinner with us. I rarely get to enjoy a good meal with her, so this was a real treat. She also got to meet some of my crazy friends! After checking and re-checking gear, a good night’s sleep was interrupted only by two racoons fighting on our balcony at 3am. I was too lazy/tired to take a picture. Also, Peggy’s luggage arrived at 4am. First, a few notes. We used a few different maps for this trip. 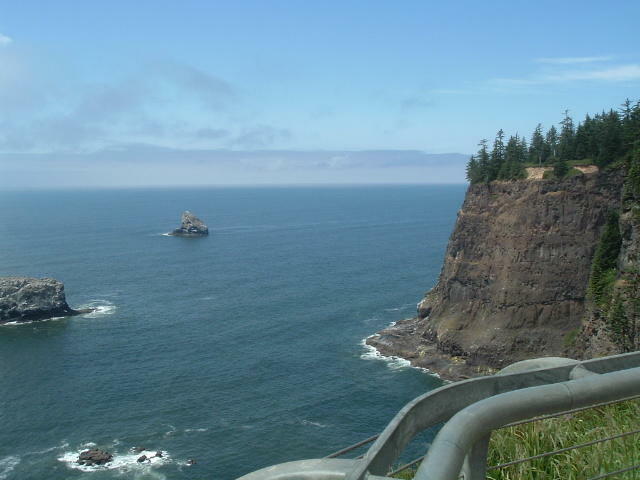 The Oregon Department of Transportation distributes a wonderful map of the coast route, but it isn’t very detailed. It can be found HERE. 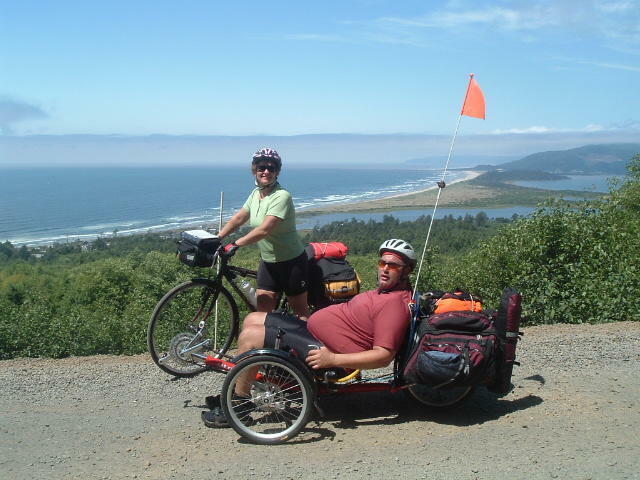 Bicycling the Pacific Coast is a wonderful resource for the entire coast route, providing information about points of interest, camping, hotels, etc. 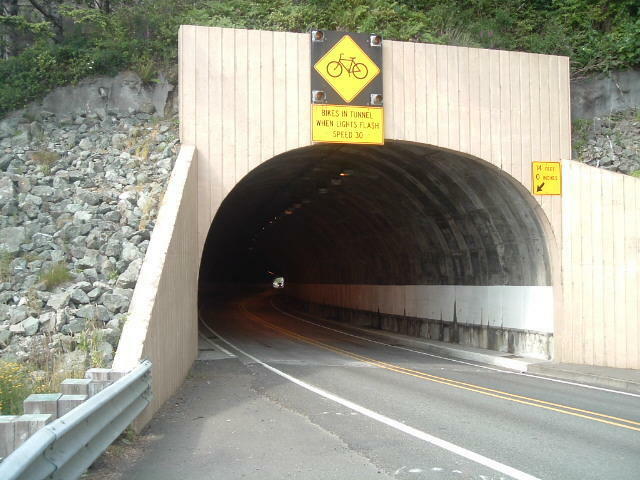 However, their route isn’t very interesting…it basically stays on the 101 Highway the whole time. My experience with their book is that their elevation profiles stink. Adventure Cycling puts together a wonderful set of maps. While they aren’t very detailed, they provide a number of scenic loops off of the highway. So, for our adventure, we followed the basic route from the first two sources, but added as many of the scenic loops from ACA as possible. We all met at a coffee shop in town to get started. 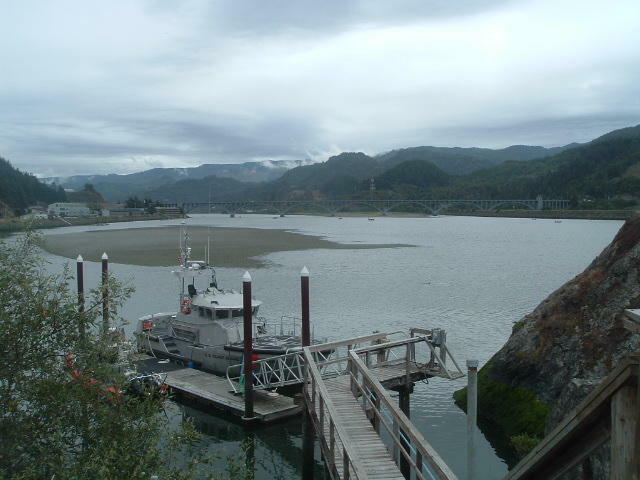 The first day started with a beautiful route along the Lewis and Clark Trail from Astoria into Seaside. The roads were quiet, and the company wonderful (although Perry took a wrong turn pretty early on and we met up in Seaside). The group process was that everyone would ride at their own pace, and meet up at the campsite at the end of the day. Scott, Jodi and Django the wonder dog! Seaside is a dive! The only redeeming quality that I could find was that ice cream was easily accessible. Otherwise, it was a crowded tourist trap, and the traffic was terrible and followed us for 7 miles out of town! 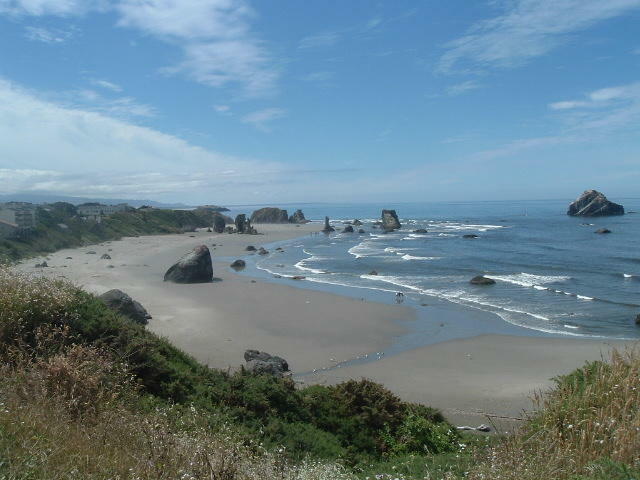 Once we arrived in Cannon Beach, it began to mellow out. Neal, Peggy, Perry, Eddie and I all enjoyed a nice lunch, found a bike shop to pick up a few things, and then continued on our way. The Arch Cape Tunnel was fun…okay, maybe it wasn’t. Actually, traffic was pretty light and the few cars on the road were polite (a recurring theme throughout the trip). But the climb after the tunnel was brutal! The fog also rolled in, so we were climbing in zero-visibility conditions. With the Dinotte tail light, I wasn’t really worried about being seen. However, I imagine I missed some stunning views of the ocean. After a quick stop for groceries, we rolled into our first camp for a relaxing evening. Today’s ride was one of my favorite. 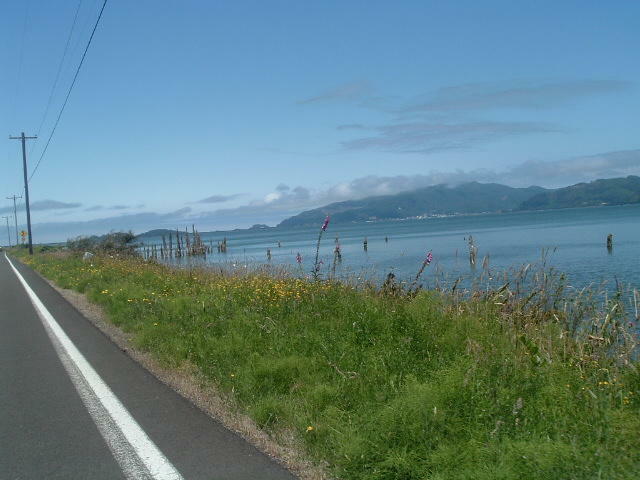 The route started along the 101 and consisted of gentle rolling hills along the coast, wide shoulders and diverse scenery. Perry and I ended up leading the group. 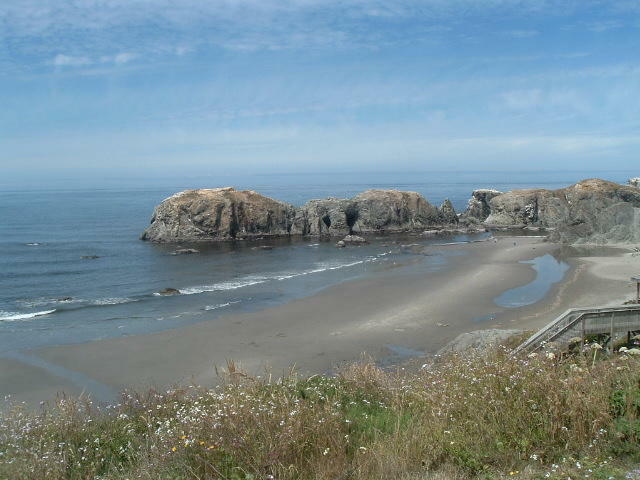 We stopped in Rockaway Beach for a quick break, and met an older man who proceeded to talk our ears off for 20 minutes. For the life of me, I can’t remember most of what he said, but whatever it was, he was interesting and had a perspective that only a 90 year old man can have. We carried on into Tillamook for a visit to the cheese factory. I have to tell you, Neal spent weeks raving about the ice cream at the Tillamook Cheese Factory. So, I pulled up and immediately headed for the line. Upon walking out with my double scoop of something chocolate and peanut butter, I realized that I was the only one eating. 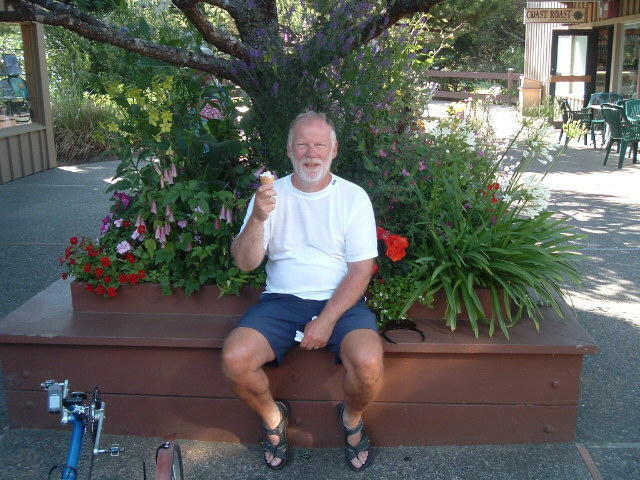 Apparently my compadres didn’t understand a basic tenant of bicycling touring – ice cream is not optional! 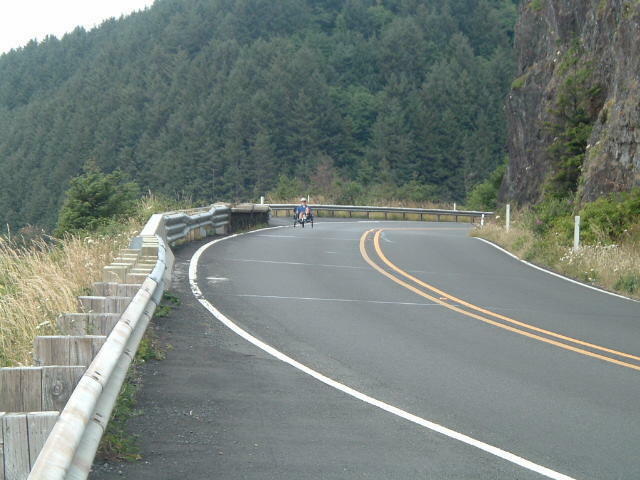 They will never know what they missed… FWIW, the city of Tillamook had the most poorly maintained roads on the entire trip. Neal is upset that he didn’t get any ice cream! At last, you make a left turn and start climbing. This shot is at about 800 feet, and provided a great backdrop for rider portraits. But the top is still several hundred feet further up! We never really knew what Eddie was carrying in that trailer, but it sure looked heavy! At last, we reach the top! Notice who is smiling. Note, she only had three items in those bags! 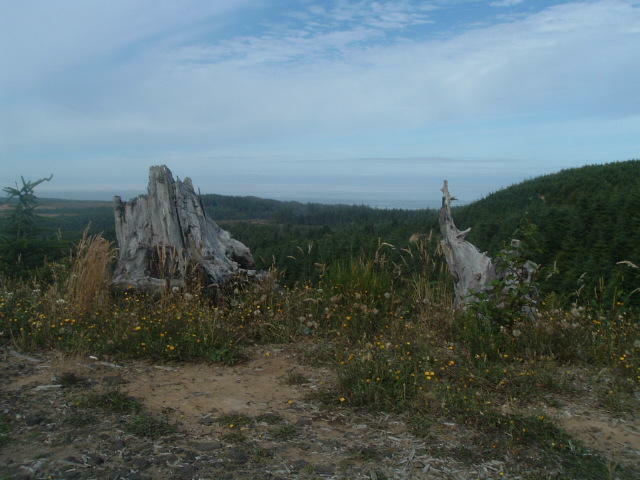 Once we reached the top, however, we had a spectacular descent down to Cape Lookout. We stopped for groceries (note to self: The problem with bringing a trailer is that everyone treats you like you have an SUV) and continued into camp. Cape Lookout was probably my favorite campsite – it looked like something right out of a Tolkien novel! He didn’t even say hello. Today was hard. 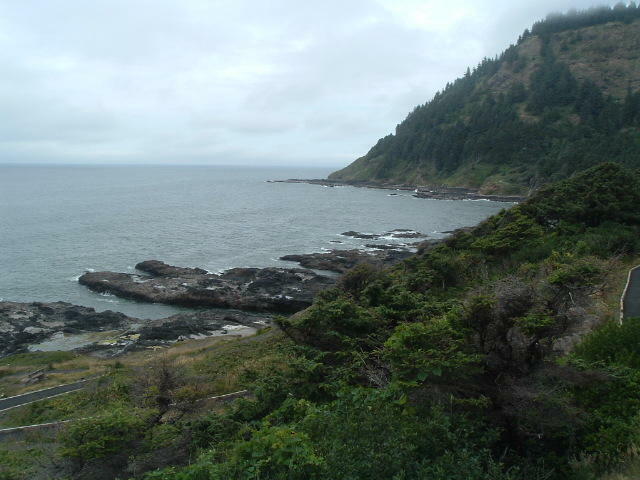 In addition to climbing out of Cape Lookout, we also climbed Slab Creek and the Otter Loop. Slab Creek, an ACA side trip, was absolutely amazing! 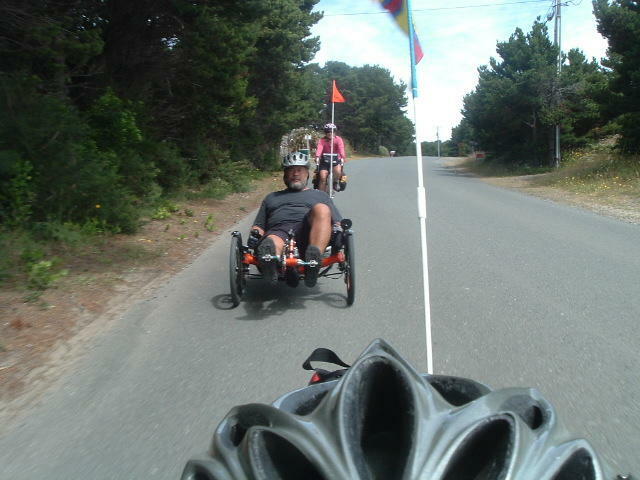 After the Cape Lookout climb, we cruised along the scenic coast, soaking in more sun and gently rolling terrain. 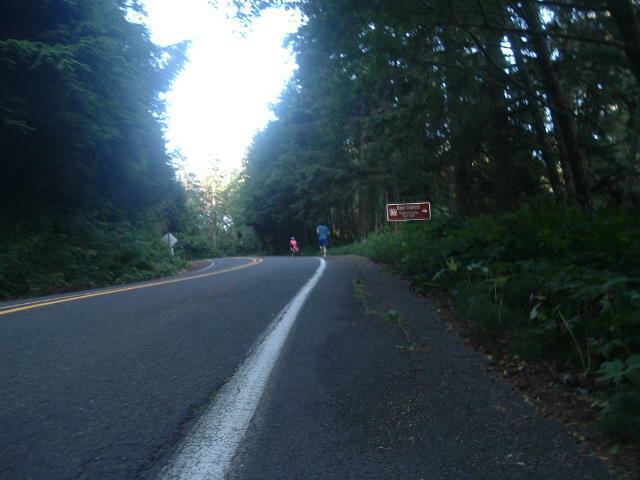 We met Steve on our way up one of the longer rollers – he had just finished his cross-country trek and was headed for Astoria. Note, he is the really skinny one on the left. I rode across the entire country, and all you have to offer me is trail mix?!? The turn onto Slab Creek Rd. was a welcome relief from the 101 traffic. Again we rode up a beautiful tree-lined road surrounded by wildlife, greenery and sunny skies. 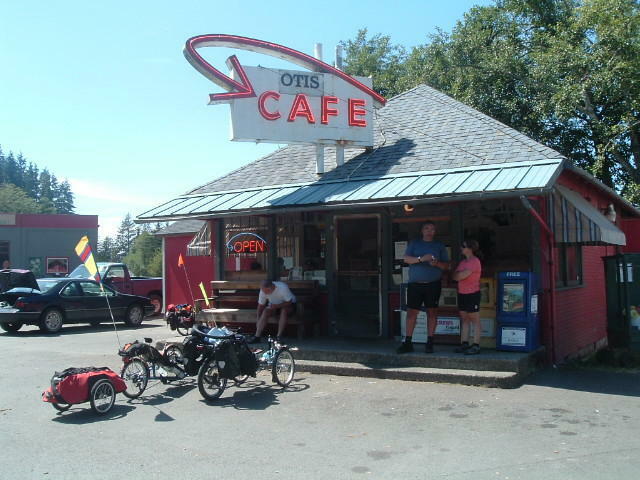 A fast descent into Otis brought us to a highlight of the trip – the Otis Cafe! 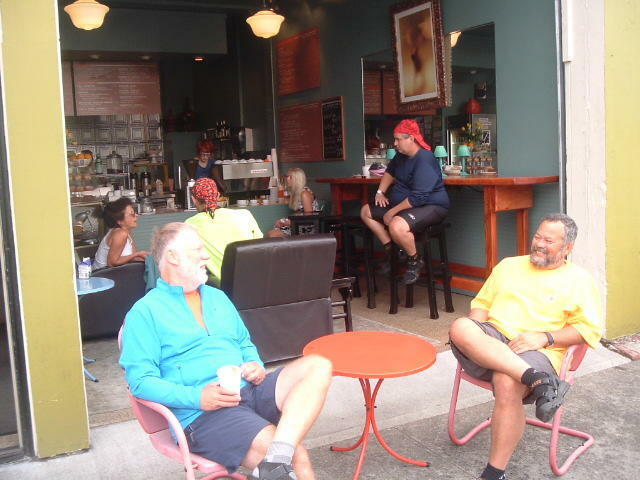 It was recommended by a few friends that we stop in as the owner rides a recumbent. Unfortunately, she wasn’t there, but we enjoyed the large portions of great food (I still can’t get over not paying sales tax). I even bought an apple pie to take with us. This point in the tour was a real low one…Scott, Jody and Django decided to say goodbye and carry on by themselves. Because they were schlepping a dog, the pace was a bit too much. 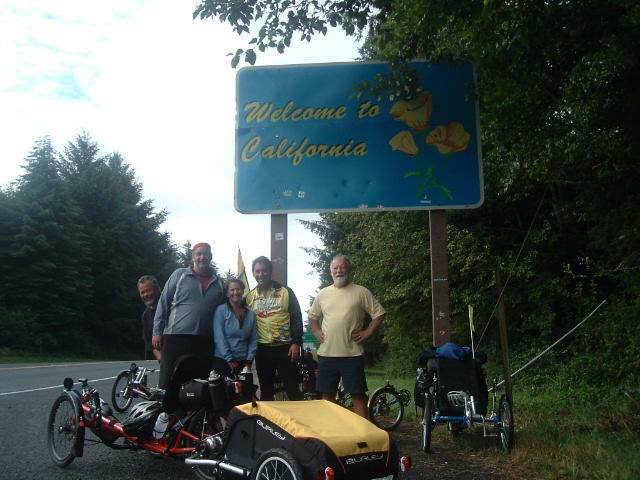 They really wanted to explore the coast at their own pace, so we said our goodbyes and wished them a safe journey (for what it’s worth, Scott is currently riding across the country. Check out his blog HERE. 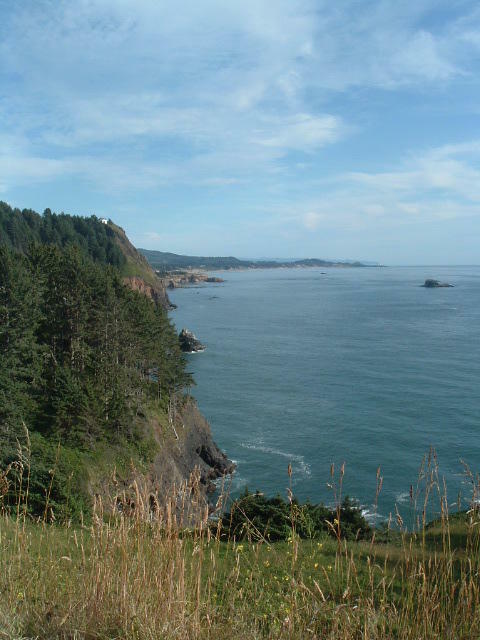 Perry and I motored on to Beverly Beach, stopping for ice cream at the spa outside of Lincoln City. 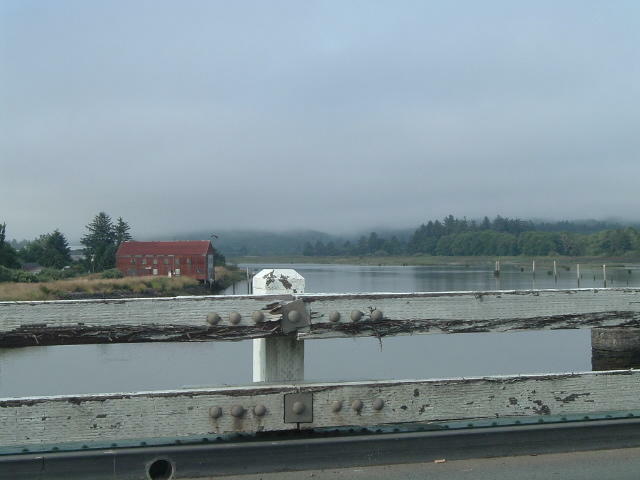 At one point, Perry wanted to get off the highway to see the water and houses. While riding, we hit a couple tall speed bumps. As my front wheel hit the bumps, it suddenly occurred to me that there was a pie sitting in the trailer! I thought for sure that we would arrive at Beverly Beach with a pie stuck to the top of a box. Fortunately, it survived and we enjoyed it immensely. 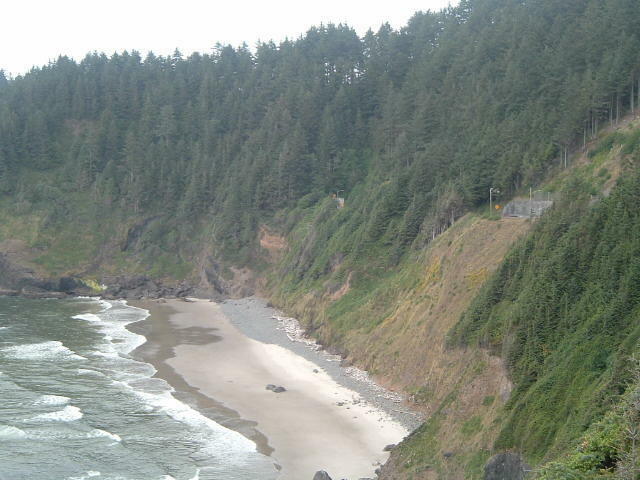 The Otter Loop is a scenic drive that bypasses the 101 and travels along a high cliff leading up to Foul Weather Point. 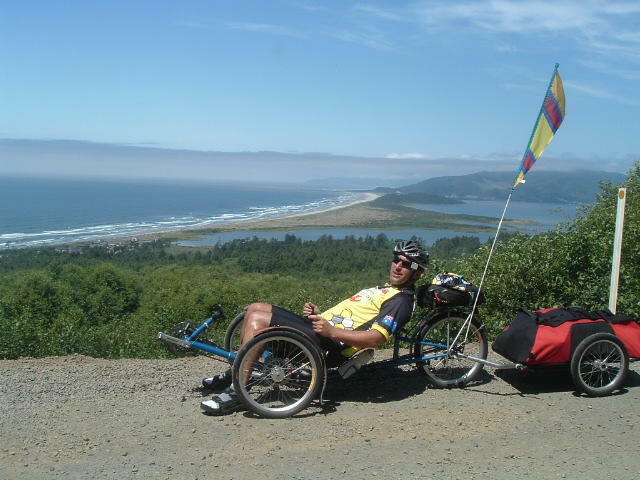 The views are breathtaking, but after 60 miles, the 400foot climb is difficult. I’m sitting here at the Sea Lion Caves (a tourist trap) enjoying my ice cream while Perry gets suckered! 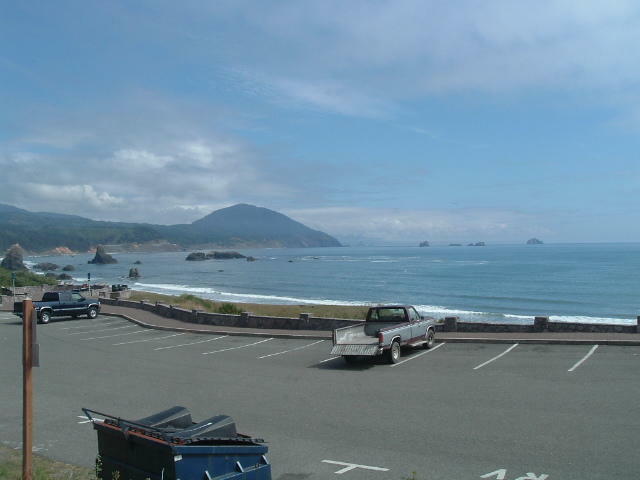 Today has been another classic Oregon Coast day. 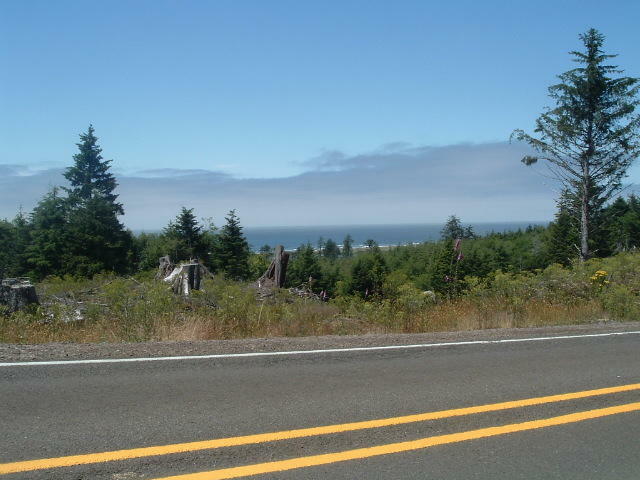 The hilly road leaving Yachats was newly paved and featured classic Oregon Coast vistas and views. It’s been a little overcast today, and we even got a little drizzle. 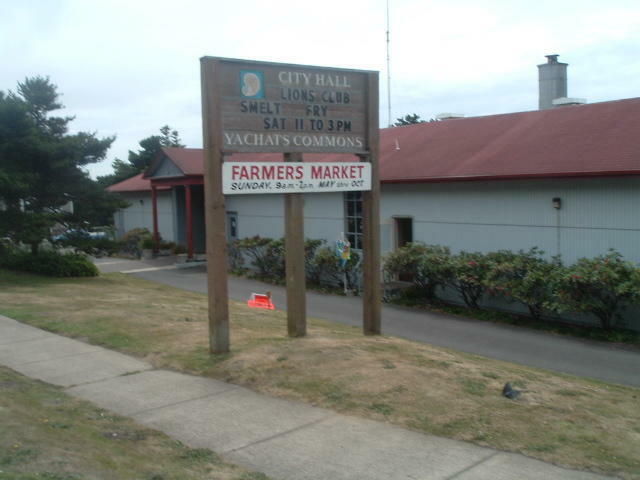 We had lunch in Yachats at their annual Smelt Fish Fry. Being the fried fish lover that I am, I opted for two types of homemade pie instead! Seeing the same people over and over actually helped avert disaster yesterday. Perry and I stopped at a deli to jump on the internet. Shortly thereafter, Kevin pulled in, picked up some food and left. 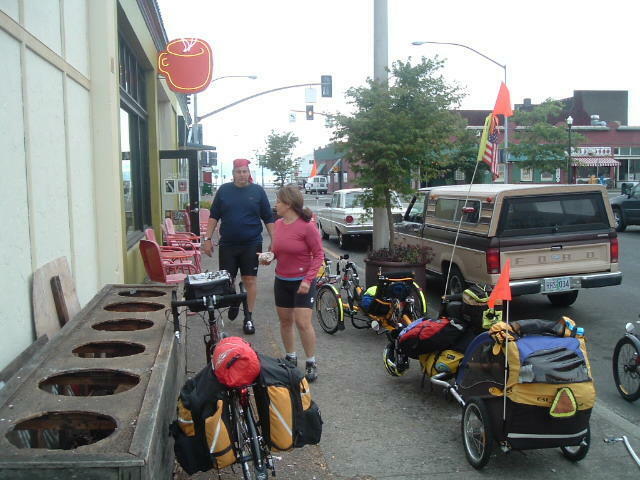 After we left, Neal and Peggy pulled in and overheard the clerk telling someone that a cyclist had left their wallet at the counter. They immediately called us, we caught up with Kevin, and Neal and Peggy brought his wallet with them to the lunch stop. Needless to say, Kevin was thrilled that he didn’t have to backtrack 30 miles to try and find it! Tonight we are moteling it in Florence at the Silver Sands. They were very generous with their washing machine and we slept well. Eddie is missing in action…cell service is bad and we have no idea where he is. Today was a tough day. 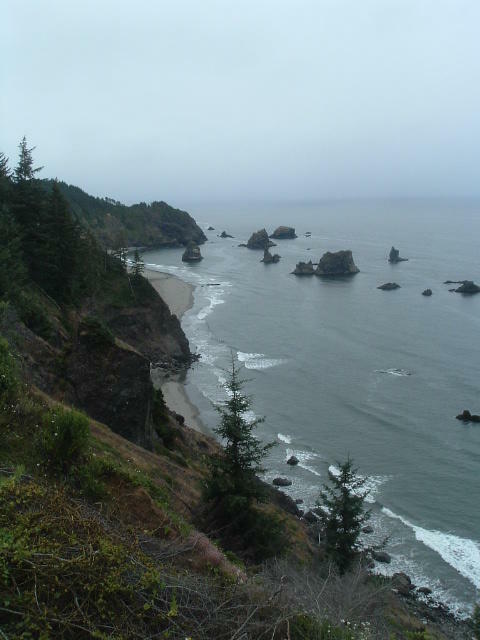 It started out looking like typical Oregon weather…drizzly, overcast and cold. We rode through this for the first 20 miles or so, not really taking any pictures. Just plugging along… However, we did find Eddie. Apparently, he stayed in a different motel in Florence, but his cell phone was dead and he couldn’t call us. 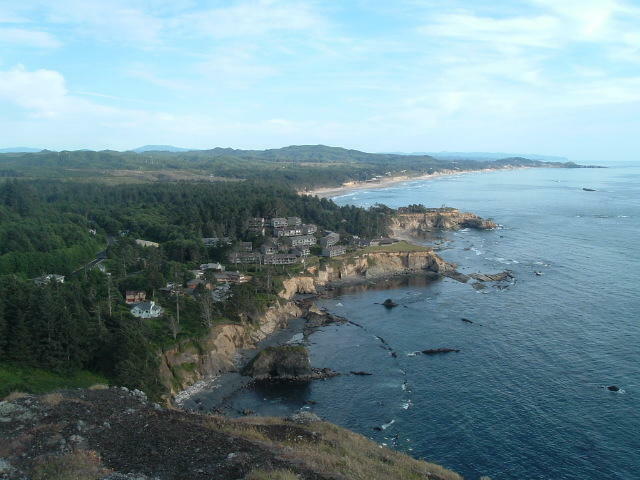 The first real point of interest was the Umpqua Lighthouse. 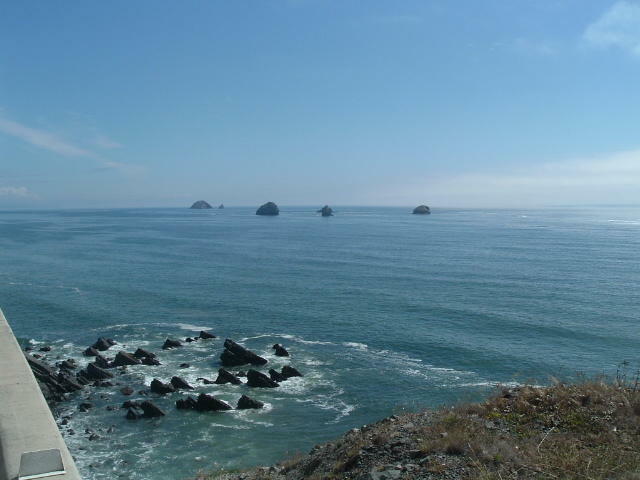 This lighthouse was build in 1856 when it was thought that the Umpqua river would be a major West Coast shipping center. In 1857, the foundation eroded during the storm season (it was built on sand). In 1863, the erosion continued until the residents considered the lighthouse unsafe. It was abandoned and another lighthouse was build 25 miles to the south. 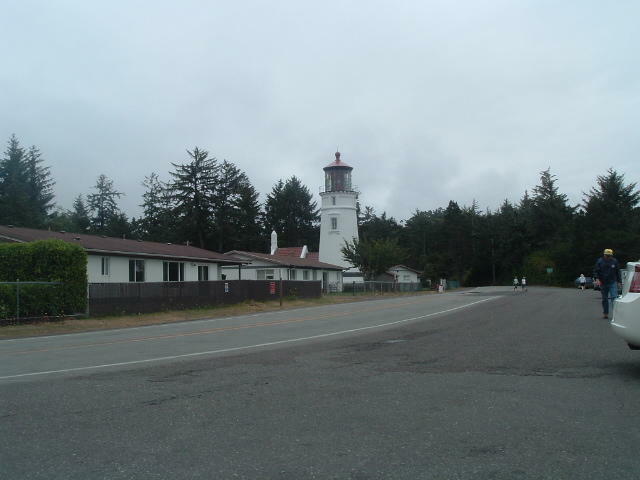 The current lighthouse was built in 1888, and was placed further inland to avoid similar problems. We toured the site – it’s amazing what these men put themselves through! I was particularly impressed by the Life Saving Crew, a group of men whose sole purpose was to go out and save sailors who were stranded because of storms. The rest of the journey continued along the 101, and got rather demoralizing at times. The traffic never seemed dangerous, just noisy. The constand rumble of RVs was not condusive to enjoying the scenery. 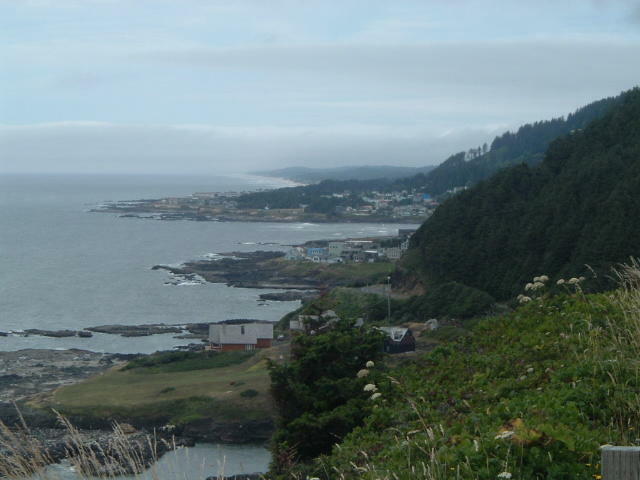 Perry and I stopped for a much needed lunch in Coos Bay – Pizza at Daves. I can’t say I recommend it. The last 5-10 miles along the bay were an enjoyable rollercoaster. We actually arrived into camp a little early, got a shower and enjoyed a beautiful sunset. Today started with an encounter with the Seven Devils (and this was before breakfast!). I thought that the seven devils referred to the number of dogs that would chase us up the hills. In fact, there were only four dogs, but approximately 700 hills. The fantastic scenery was well-deserved but the extended 12-15% grades first thing in the morning were not fun. It is basically one long climb up to the top, followed by multiple shorter climbs across the ridge. The descent was just as exhilerating as the climb up was hard. The descent begins with these words. Usually, we have a good breakfast before hitting the road. Logistics didn’t allow us that luxry this morning, and by the time we reached Bandon (25 miles and 1900 feet of climbing), we were starving! The Station served up a wonderful breakfast – Perry and I even ordered seconds. Yesterday, I received calls from Neal and Peggy, and Scott and Jody. Neal and Peggy stayed in Florence for a rest day, and were going to rent a UHaul down to Port Osgood to join us for the last 10 miles. 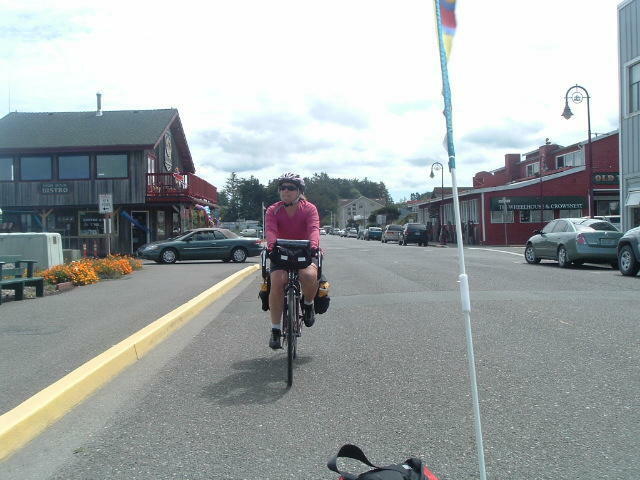 Peggy joined up with us in Bandon and we rode through the scenic Bandon seashores together. Neal met up with us on the 101 and took the trailers from me and Eddie. It was nice riding 20 miles withough gear! Scott and Jody decided to join us again today. 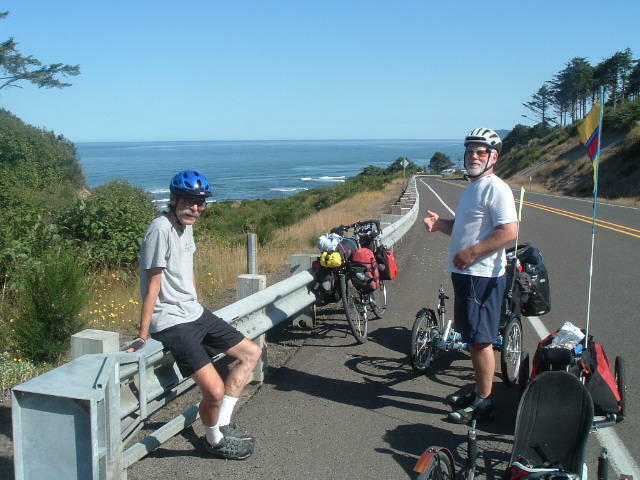 They also rented a U-Haul to Bandon, figuring we would catch up with them on our way down. 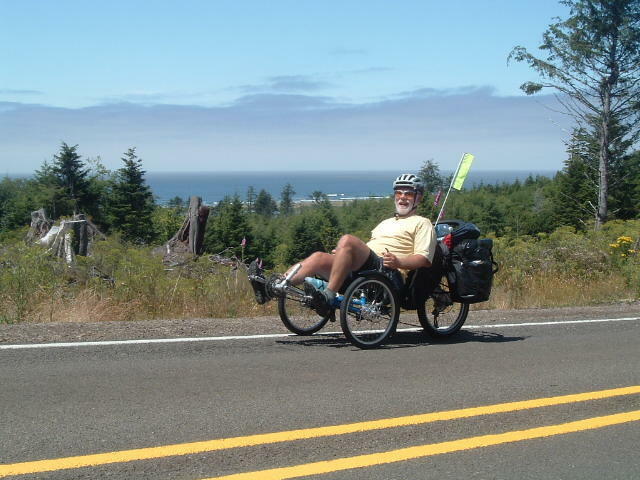 Unfortunately, about 15 miles south of Bandon, they had a catastrophic rear wheel failure! 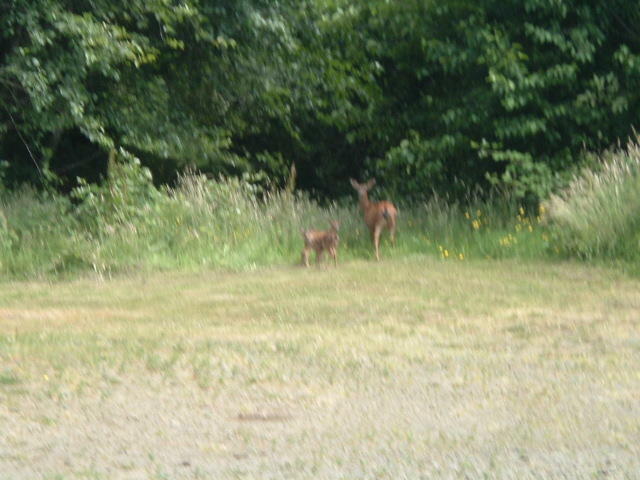 Scott hitched a ride back to Bandon and they headed for home. The day ended in Humbug Mountain with a delicious dinner of fajitas made by Neal and Peggy. Let it forever be memorialized that they forgot to pick up breakfast! This was supposed to be an easy day. Of course by now we should know not to believe the book… It rained all night, and the hole in my tent fly just got bigger and bigger. 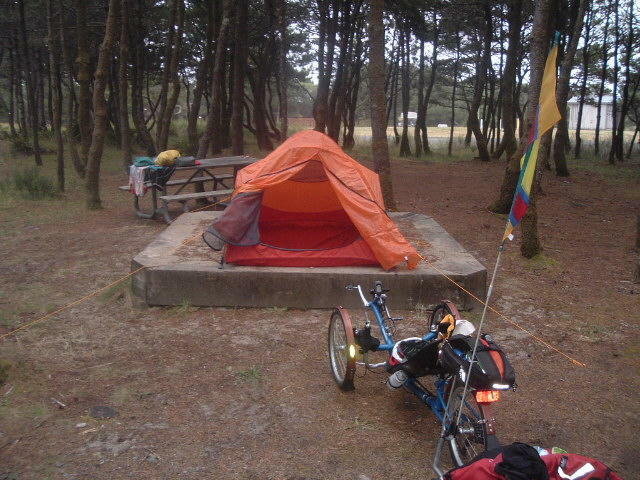 This was another campsite located 20 miles from the first cafe, so we were on EMPTY as we rode over Humbug Mountain, past dinosaurs and along the beach. This was the only time we skipped an ACA side trip as we were more interested in getting breakfast. At some point during the day, we all independently decided that motel rooms were in order. Once we reached Brookings, we met up at the Pacific Sunset motel and went out for dinner at Pancho’s Mexican Grill (I kept looking for Lefty, but to no avail). The food and margueritas were good, the company was still exceptional, and we toasted our success in making it down the coast! Our last day was short. 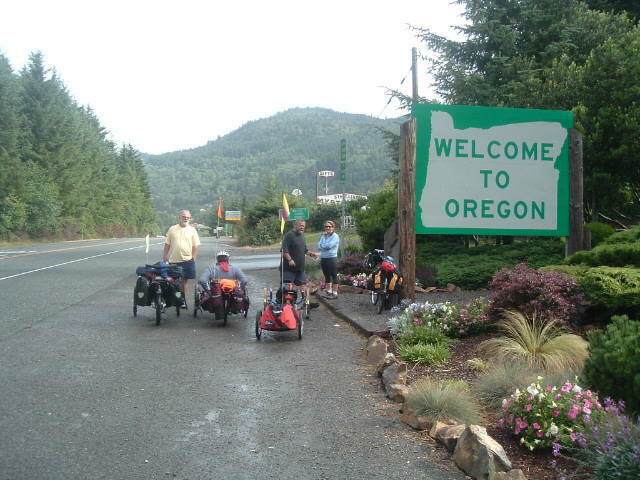 Originally we intended to ride to Crescent City, but decided that going just to the border would get us back to Portland a little earlier. 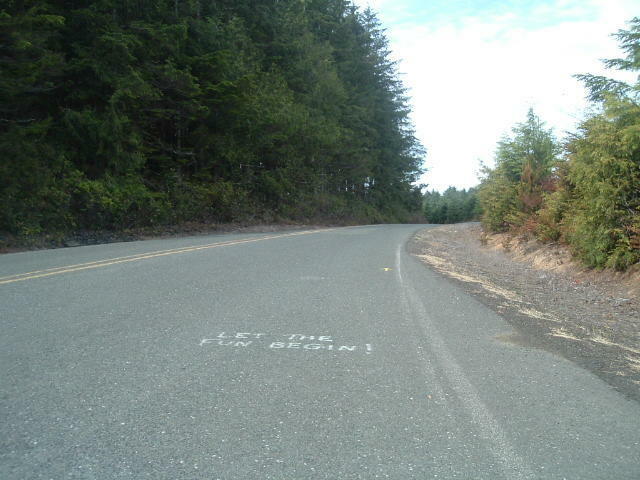 Again the book was wrong and the 200 foot climb out of Brookings did not materialize. Instead, we had an easy ride along through farmlands and estates south of Brookings. 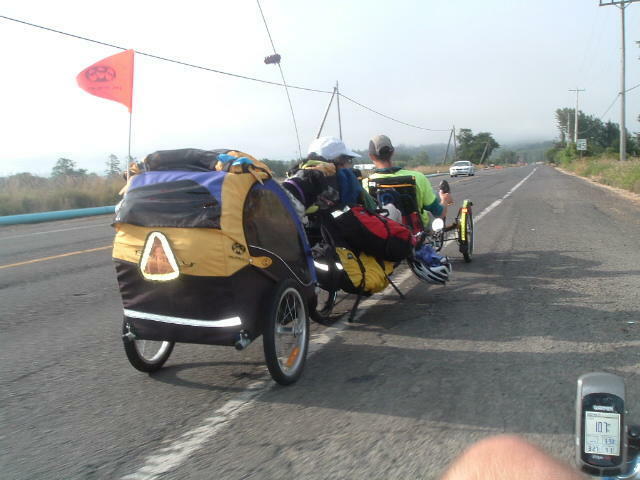 David and Adrienne were on their way up to Portland to crew on Race Across Oregon, and volunteered to give us a ride. We had a great drive up through the Oregon interior. 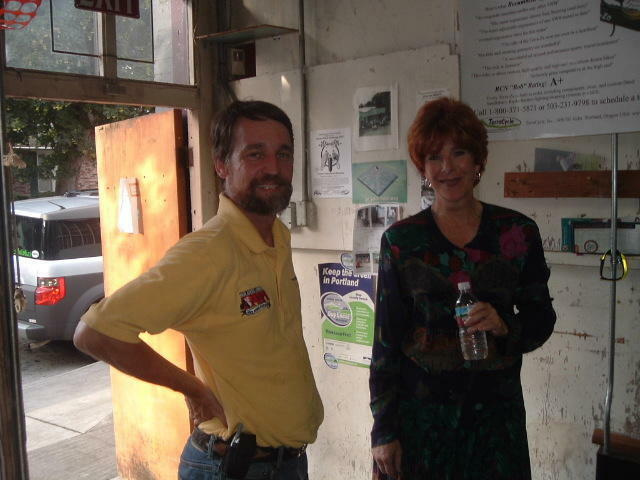 We arrived in Portland to talk about our adventure at the OHPV monthly meeting at Terracycles. Dinner at Hoda’s Lebanese Restaurant was fantastic, and the group split up to stay at the homes of Pat Franz and Robert Johnson. 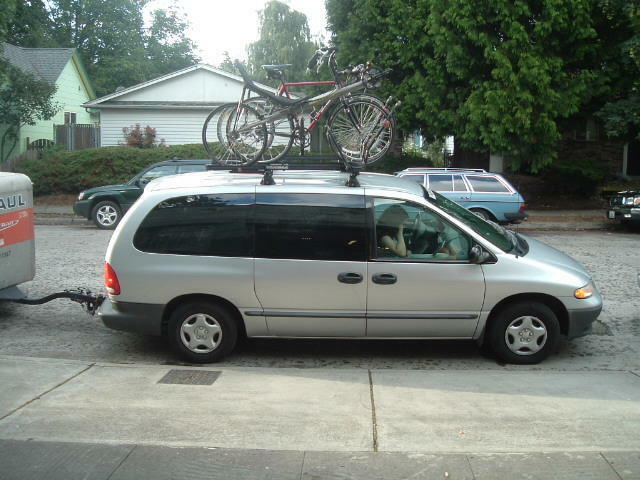 Yep, we fit six people and seven bikes in there!